This series of blogs is part of our Excel VBA online tutorial. We also run classroom-based training courses in Excel and in VBA. VBA is what is called an object-orientated programming language (OOP if you want to impress people), and you won't get far with it without understanding what objects, collections, methods and properties mean. That's what this blog tries to demystify! Presumbably the logic for the symbols is that throwing a green brick at someone is definitely a doing thing, and not a property! An example of the help given for the Workbook object. 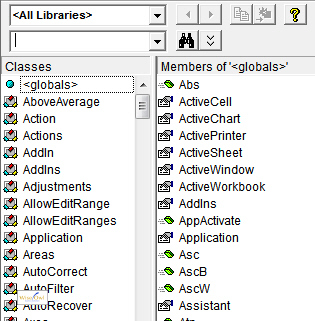 A tiny part of the complete Excel object model (ie the set of all of the collections, objects, methods and properties which together make up Excel). So with all that preamble out of the way, let's have a look at what collections, objects, methods and properties are in more detail!